Efforts to boost living standards for low-income families often focus on government assistance. While transfers and tax credits are clearly important to families in the bottom fifth, this group depends on pay from the labor market for the majority of their income. This means improving income for low-income families depends on intensifying efforts to increase their wages. Over the last three-and-a-half decades, wages and wage-related safety-net income (from such sources as the Earned Income Tax Credit) have grown in importance to low-income households. This is the case because their work hours have increased and government support through cash assistance has diminished as programs such as Temporary Assistance to Needy Families (TANF) have become far less generous. The figure below displays the major sources of income for households in the bottom fifth of the income distribution from 1979 to 2010. It shows that incomes of the bottom fifth are increasingly dependent on their earnings from work. Wages, employer-provided benefits, and tax credits that are dependent on work made up 69.7 percent of bottom-fifth incomes in 2010, compared with only 57.5 percent in 1979. While government in-kind benefits from sources such as Supplemental Nutrition Assistance Program (SNAP) and Medicaid have increased from 13.2 percent of bottom-fifth incomes in 1979 to 18.3 percent in 2010, cash transfers such as welfare payments have declined 8.2 percentage points (from 18.7 percent to 10.5 percent). The safety-net system has clearly become increasingly tied to work through programs such as the EITC and the child tax credit, which overwhelmingly benefits households with labor earnings. Efforts to improve the incomes of low-income households must feature efforts to boost labor earnings. * Data are derived from weighted average of non-elderly childless households and households with children. 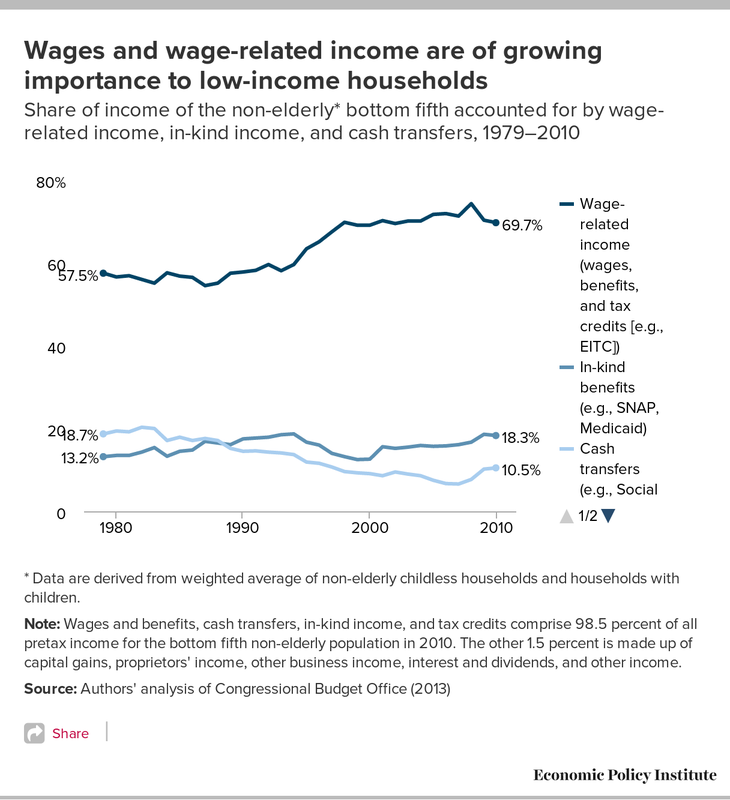 Note: Wages and benefits, cash transfers, in-kind income, and tax credits comprise 98.5 percent of all pretax income for the bottom fifth non-elderly population in 2010. The other 1.5 percent is made up of capital gains, proprietors' income, other business income, interest and dividends, and other income. This Economic Snapshot is part of EPI’s new project Raising America’s Pay, a research and public education initiative that seeks to make wage growth an urgent national priority. Over the next three years, Raising America’s Pay will highlight our failure to provide broad-based wage growth, research and explain the role of labor market policies and practices in depressing wage growth, and identify policies that will boost wages for the broad-middle class.